When looking for a go-to style that works for any occasion, it's important to choose a style that is versatile and low maintence. 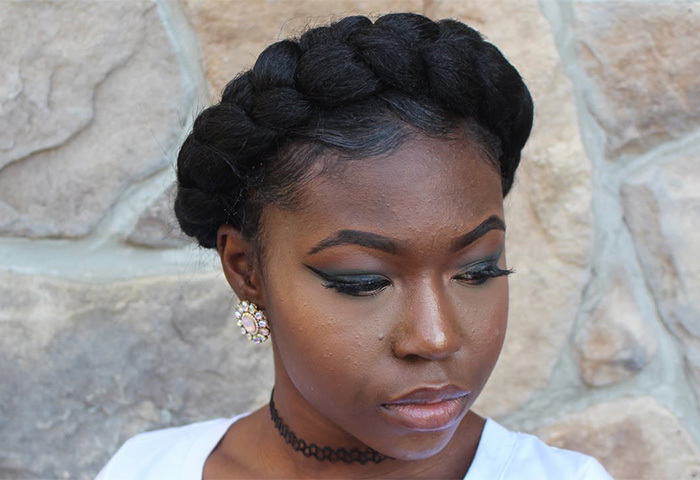 There are plenty of great hairstyles to choose from, but one that naturalistas love is the halo braid and for good reason. It is easy to create on almost any length of hair and hair type, it can be adapted into several looks, and it only takes a few minutes to achieve as opposed to more time-consuming styles. Here are 5 ways to rock the halo braid, scroll down to see which one suits you best! This is the classic look that you need to master to create any of the other looks on this list. The halo braid is the foundation so learning how to master it is important if you also want to try the other styles. Whether you are using this to learn the others or just trying a halo braid for the first time, this short tutorial will walk you through it. For a twist on the natural hair halo braid, this beaded look is a fresh take on a classic look. While typical halo braids keep all your strands tucked up into the braid, this style frames your face and adds some texture and accessories to your look effortlessly. The great thing about this style is that it can easily be done to any hair length. When you are transitioning and still learning what styles work best for your length, this is a great way to play up short hair with ease. While the usual look of a halo braid is to encircle the crown of your head, you can also add a braided bun at the bottom for even more texture and appeal. This is a pretty look for work or special occasions when you want a little something extra to your style. When you want a pop of color, a halo braid for your crown, and a long pony, this look is the real triple threat. This look is perfect for a fun summer style when you want to have fun while turning heads. Have you worn the halo braid before? Let us know how you style your halo braid in the comments below.